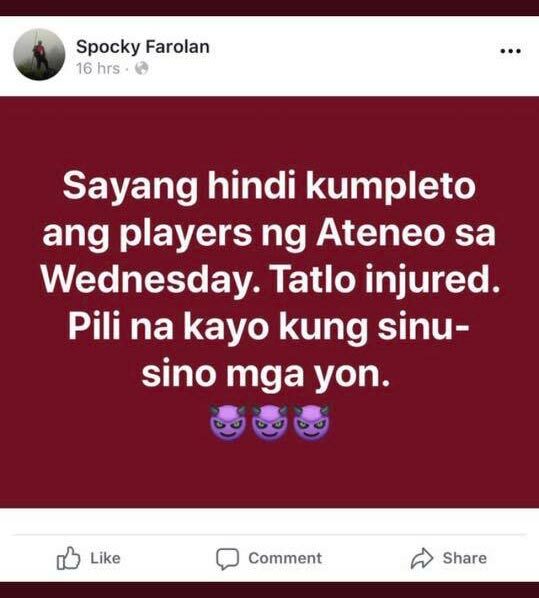 A member of the UP Board of Regents posted a cryptic message on facebook that said three Ateneo basketball players will be injured. The university has released a statement, saying that they “disassociate” themselves from the post of Farolan and they highly condemn violence. 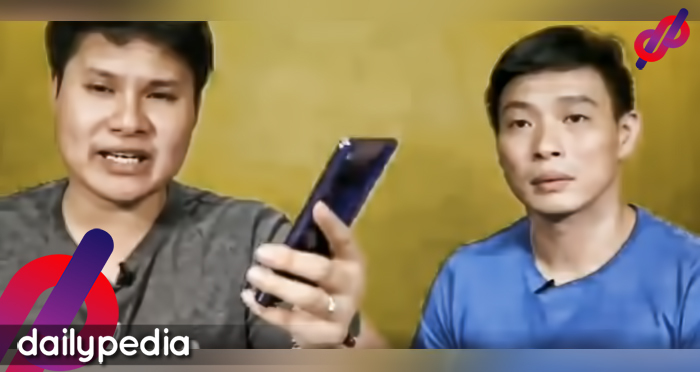 A University of the Philippines (UP) official has been under fire for posting a confusing and alarming message that people saw as a threat to the basketball players of Ateneo. 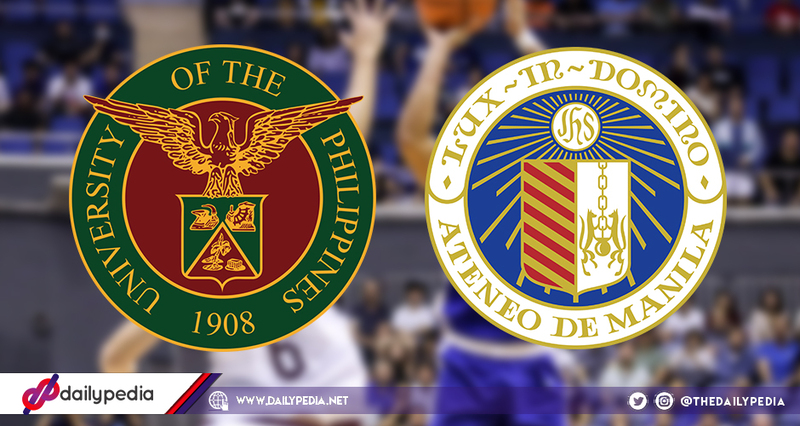 It spread ahead of game two of the UAAP Season 81 basketball finals. 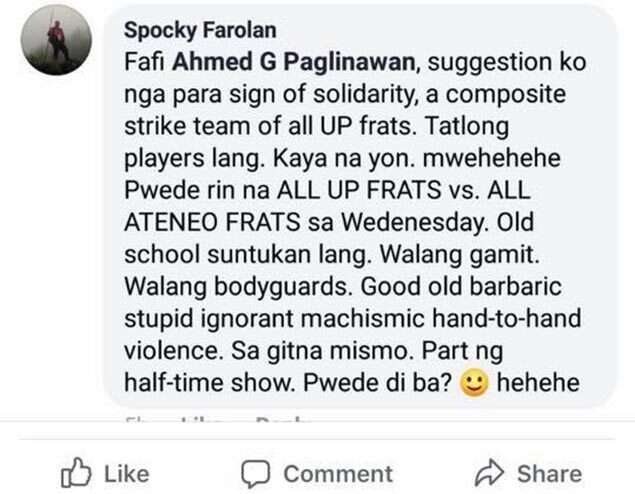 The member of UP Board of Regents, Spocky Farolan, posted the message on facebook a day after the Maroons lost to the Blue Eagles at game one. He hinted that Ateneo won’t have complete players at the next game as three players would be injured and it’s just up to the people to pick who those three are. In a comment, Farolan said that a “composite strike team of all UP frats” should be made up as a “sign of solidarity”. After Netizens have reacted negartively, he deleted his post and said that it was sarcastic and he added that violence, barbaric, machismo, stupid and ignorant. UP Board of Regents’ statement. On December 3, the UP Board of Regents released a statement and said that they “dissociate” themselves from the message of Farolan that “appeared to advocate the usage of violence” against Ateneo’s basketball players. They also apologized to the officials, staff, and athletes of Ateneo, as well as the UP community who were affected by his status. “Committed to a higher standard of accountability for its members, the Board hereby withdraws its recommendation for the reappointment of Regent Farolan to the Board of Regents. We enjoin Regent Farolan from making any such further statements which can compromise the reputation and the goodwill of the University,” they concluded.